Recently I started reading a book called “Life of Pi.” I’ve only gotten 50 pages or so in, so please- no spoilers! For all I know, it’ll end just absolutely rotten, but for now I’m enjoying it. In the beginning of this book, the main character gives a brief synopsis on a seemingly apathetic lazy-bones creature we so loving have named the sloth. In a tree, a sloth moves at roughly 400 meters an hour. On the ground, he becomes increasingly lethargic and moves at a rapid 250 meters an hour! A healthy adult human runs a mile in about 12 minutes. To make it simple, where you can get in 90 seconds, it takes a sloth an hour. A sloth sleeps for 20 hours a day. 20! Aren’t we just the opposite? We go and go, running around in circles like the Tasmanian Devil for 20 hours a day, but the sloth sleeps peacefully the whole time. He doesn’t stress and he doesn’t worry. Sloths don’t worry about success or achievements. They don’t compete over who can sleep the longest or the hardest. God did not design them to be power-thirsty, competitive, and success-driven. Rather, He built them to sleep almost the entire day, looking like a group of yogis at a convention, meditating upside down. Can you imagine if a sloth could pray? What a prayer warrior they would make! Ha! The thought absolutely amuses me. How does a sloth survive if it doesn’t hardly ever move? They’ve survived 60 million years somehow right? Only 2 out of 6 species of sloths are endangered, so how have they managed to avoid being extinct? They are laying in plain sight, not moving, and asleep as well! Sounds like a perfect target for a predator’s dinner right? The way they survive is simple. Sloths survive the same way they do everything else. They don’t move! Their fur has a special algae that changes colors based on the season, to help them camoflauge. By not moving, they blend in perfectly and go almost completely unnoticed by predators. Amazing! What if we modeled our lives after the sloth? I realize we live in a society where in order to survive we can not just sleep our lives away, or lay around meditating all the time. Truly though, the sloth offers a lesson straight from God’s hand if we will just accept it. God made all creatures for our delight as well as to tell us a little of who He is. What if we stopped moving so fast? What if, when a predator came knocking on the door of your mind you were just still, knowing God has made you perfectly and nothing will harm you? 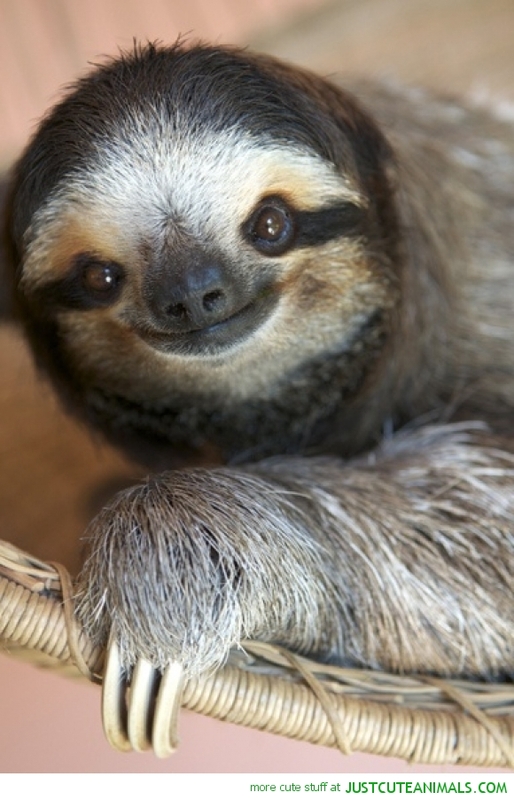 Sloths carry this sweet grin on their faces when they are awake. It’s almost like they are in on the biggest secret of the universe. Looking at a sloth, you can almost hear it’s thoughts. It’s like they whisper, “Everything is ok. God is good. Look at this amazing planet He made just for us! Don’t you just love the trees and food and sunshine? It’s all so amazing….I think I’ll take a 20 hour nap.” Then they blissfully fall into a deep stress-free rest we can’t even fathom how to begin imitating. The next time panic, worry, and anxiety creep up on you, take a lesson from the sloth: Be still. Don’t run off and make an irrational decision outside of God’s will. Pray. Lean into a God who loves you more than you will ever fully understand. Accept His good and perfect rest. Psalms 46:10 says, “Be still and know that I am God.” Looking at the photo to the left, I think the sloth as a soul-deep understanding of Psalms 46:10. I want to be a sloth. Do you want to be like the sloth? Isn’t “sloth” a deadly sin though….? Not saying we should “be lazy” but that we could learn a lot from how the sloth is content, doesn’t worry, doesn’t panic, and trusts God completely. Jesus > Religion. You’ll find no fans of religion here my friend!